In August 2017 Freedom Forum, IBP’s civil society research partner for the Open Budget Survey in Nepal, and the United Nations Development Programme (UNDP) released Nepal’s Citizens Climate Budget: Where is Nepal’s Money Being Allocated?, which provides the public with accessible information, in Nepali and English, on how the government is using public money to address climate change and its effects through the national budget. Using budget data from the Ministry of Finance to produce easily understandable visualizations and infographics, Freedom Forum and UNDP collaborated on the production the country’s first Climate Citizens Budget (CCB) with an aim to increase the public’s understanding of how the government is investing in activities to address this critical issue – and thus the ability of citizens and civil society organizations (CSOs) to participate in budget decisions and oversight. 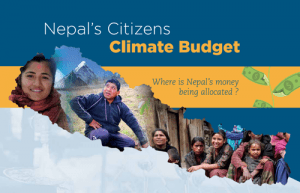 Why does Nepal need a Citizens Climate Budget? Nepal is one of the world’s most vulnerable countries to the effects of climate change, ranking in the top 20 countries that have suffered the most from the impacts of global climate change, through floods, forest fires, drought, and other climate-induced disasters. An increase in these climate impacts would threaten Nepal’s development efforts and the lives and livelihoods of its people, particularly women and those who are poor. In response, Nepal committed through the Paris Agreement to ambitious action to reduce its greenhouse gas emissions and adapt to the negative impacts of climate change on the country’s development and its people. To manage its response to climate change, the government has put in place several laws and frameworks, including those for managing climate-related public resources. The latter includes a climate expenditure tagging system, with UNDP support, to identify climate-related budget allocations, and providing formal spaces at the national and local level for CSOs and citizens to participate in climate change planning and budgeting. For this participation to help ensure that relevant public funds are used effectively and as intended to address the potential impacts of climate change and support sustainable development, citizens and CSOs need access to budget information. Government budget documents, with their technical language and complex data tables, can be difficult for citizens and CSOs to understand and are generally not effective in communicating how the budget will affect communities and people’s lives. By presenting budget information in accessible language and in easily understood visual elements, Citizens Budgets foster greater understanding of how public money is being managed. To tell the story of how Freedom Forum and the UNDP came together to produce the Nepal Climate Citizens Budget, IBP asked Krishna Sakpota from Freedom Forum and Sujala Pant, formerly from the UNDP the following questions. IBP: Why did you undertake the project of developing a Citizens Climate Budget for Nepal? KS: As a research partner for IBP’s Open Budget Survey, Freedom Forum has long been pushing for the government to publish Citizens Budgets as part of the national budget system, which would greatly improve citizens’ ability to comprehend the budget data and participate in budgetary processes. Thus when UNDP provided us with the opportunity to develop Nepal’s Citizens Climate Budget, we wanted to demonstrate the benefits in the structure and presentation of information in such a document, and to prod the government to develop Citizens Budgets for all other budgetary documents. SP: The UNDP has been working with the Nepali government in undertaking a number of reform processes, including a number of very technical publications (e.g., the Climate Public Expenditure and Institutional Review, the Climate Budget Tagging, and annual budget reports) on the country’s management of public funds intended to address climate change. It was time to translate this technical work into a format that would be understood by a wider public audience – citizens as well as policymakers – so they could understand how the government is addressing climate change and to ensure they can hold it accountable. IBP: You’ve included citizens, civil society organizations, policymakers, parliamentarians, and media in the intended audiences for the CCB. What would you like to see them do with the information? KS: The primary objective is for the audience to better understand how government is budgeting for climate change and to help stakeholders use evidence from the CCB to engage in budgetary discussions. In addition to providing data that allow policymakers to monitor trends in climate-related allocations and see how climate action integrates with other development initiatives, the CCB acts as a one-stop source of climate budget information, allowing citizens, civil society, and media to demand accountability and for intermediary organizations to help people amplify their voice for effective mobilization of resources in climate change. The champions and advocates of open development, open knowledge, and open data can also use the information to develop advocacy and awareness-raising materials to support progress on their agendas. SP: First, we wanted to help all the target groups to understand that climate change cuts across many sectors – addressing it is not the responsibility of just one. As shown in the CCB, many sectors and ministries have climate-relevant allocations. Second, freely available information on these allocations contribute to raising questions and creating a basis for informed dialogue between different groups. Finally, for parliamentarians, it is a source of information for understanding the executive’s climate agenda, and help them fulfill their budget oversight responsibilities throughout the budget cycle. IBP: Would you describe the process you used to develop and produce the Citizens Climate Budget, including challenges and unexpected developments? SP: As part of the UNDP’s regional Governance of Climate Change Finance Programme to integrate climate change finance into core planning and budgeting processes, the Nepali government was keen to improve and prioritize engagement with civil society organizations (CSOs) in order to advance discussions around climate finance, and to tackle issues like effectiveness and efficiency. At an April 2016 meeting, the government of Nepal, with the support of UNDP convened CSOs and government partners from across the region to discuss a “collaborative research for budget effectiveness.” The discussion around access to information at this gathering resulted in the government of Nepal deciding to produce a Citizens Climate Budget. Freedom Forum was selected through a bidding process to develop the CCB. KS: We first briefed the Ministry of Finance officials about the scope and potential benefits of a CCB, which the ongoing UNDP engagement with them facilitated. We then developed a comprehensive checklist of government budget data on climate allocations to include in the document. Gathering this information was fairly straightforward because we used data the government had already published. Even though there was no question of the data validity, we still worked with technical staff from the Ministry of Finance to verify the information. Next, we looked at other countries’ examples of Citizens Budgets, as well as key publications on climate finance in Nepal and decided to present the information through simplified text and sketches, charts, and graphs. Because this was to be the first Citizens Budget in Nepal, we really wanted to be creative. The biggest surprise was producing the product itself. It was very exciting to experiment with developing such a document after advocating for Citizens Budgets for so long. Because we were not very clear on what the CCB would look like, it took us more time than expected, but we are satisfied with how the CCB serves as a model for other Citizens Budgets. IBP: Now that you have released the Citizens Climate Budget and are in the process of disseminating it, how will you determine whether you were successful in achieving your goals for the project? SP: This was a pilot exercise, and we really hope that it will help to generate discussion and debate in the public sphere on the government’s efforts to address climate change. Our ultimate goal is that the government and/or civil society organizations like Freedom Forum will produce CCBs regularly so as to strengthen accountability in the use of public resources to address climate change challenges. KS: This is a pioneering work, and its success will be based on how well it serves to improve citizens’ access to climate change-relevant budgetary information, and if it enables CSOs, policymakers and media to identify and analyze the trends of budget allocations. Blending climate change and public finance will surely pave the way for more, and more effective, accountability work in this area. In terms of our next steps, we are interested in further climate change finance work in Nepal, as well as using this experience as a model for other sectors. We continue to call on the government to produce and publish Citizens Budgets for all of the key budget documents, particularly the Executive’s Budget Proposal, which lays out the government’s plans for how it will raise and spend public money to meet public needs and priorities.